When it comes to filling out course evaluations, most of us are familiar with the drill. As each semester comes to a close, evaluation forms are distributed so that students can provide feedback on their courses and instructors. Kwantlen Polytechnic University heavily encourages students to fill out these evaluations, which have been used by post-secondary institutions for decades. How the surveys are utilized, however, is unknown to the majority of students, leading many to believe that they are not being used at all. An issue that some students have with the course evaluations is that filling them out isn’t mandatory. 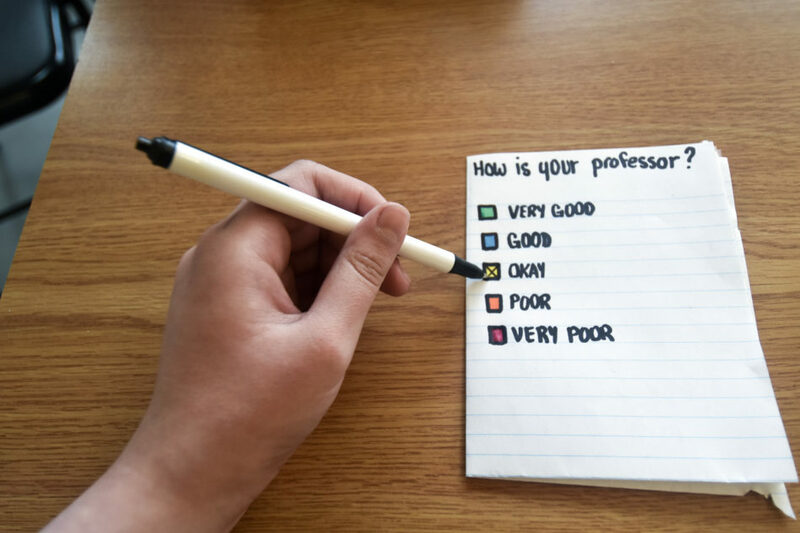 KPU student Rupinder Benipal finds that, because many students will never submit the evaluation forms, the results that are received by the administration or instructors are not representative of the feelings of the class as a whole. For instructors and post-secondary administrators, course evaluations pose a very different problem. In July, an arbitrator in Ontario directed Ryerson University to not consider student course evaluations when measuring the effectiveness of an instructor’s teaching ability, and to ensure that they play no part in decisions regarding promotions or tenure for instructors. One of the primary reasons that this trial took place is because numerous studies have found that student surveys are biased. Many students tend to consider an instructor’s physical attributes when filling out the forms, leading the results to be skewed against instructors of a different race or gender than those of the students. The arbitrator for the case, William Kaplan, found student-conducted course evaluation forms to be “downright biased and unreliable.” He argues that they should not be used as the basis for any decisions made by post-secondary institutions regarding their faculty. “It allows academic units to continually renew, revise, and improve the educational experience,” he says. Benipal sides with Ferreras. She feels that, because students are the ones listening to the lectures, taking the exams, and completing the assignments, they have the best understanding of their course and their instructor. However, because course evaluations have been found to be problematic, she agrees that universities should consider dropping them altogether.